When you think of homework and study, most of you almost immediately feel a sense of dread and negativity, right? Something to really not look forward to and something you really don't want to have to do? Well, it doesn't have to always be like that! I know, that's easier said than done, but changing the way you perceive study and school has the potential to make it a lot easier for you and improve your general mood and happiness. 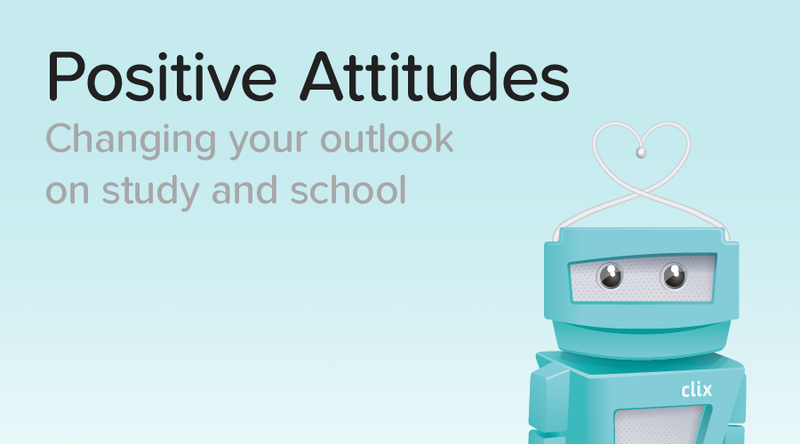 In the blog below, I'll show you some thought processes that you could try use to change your attitude and make study and school a bit more enjoyable. You might easily find yourself wanting to complain about an essay that you have to write for next Tuesday, or the list of vocab that you have to learn for your test tomorrow, but you might find it a lot easier to face these tasks if you force yourself to really think about why you're doing them. In the case of the essay, you're doing it so that you can practise, so that your teacher can correct it and so you can learn from your mistakes, so you can get better, so that finally, you can get a great mark, feel a sense of achievement and if you're in 3rd or 6th year, get the results (or college course) you want! Focusing on the future and focusing on the reasons why you're doing something that you mightn't particularly like can make it a lot easier to carry out. Also, remember, everything comes to an end eventually, and so will all the study and homework, etc. It won't last forever, so concentrate on the future, when you'll be finished, and let that be your overpowering, positive thought, instead of a potentially negative one that could end up making the task a lot harder for you. We've been there, trust us, we know it's not always singing and dancing being in school, in class, or even at home doing schoolwork. Sometimes, everything just sort of seems to be negative and it's like there's a cloud over your head all the time, and it's not easy to get rid of, especially if you're not a huge fan of school. Something that could help though, is remembering that you are in complete control of your attitude. You might be dreading something in school: an essay, a presentation, a test, whatever. Or maybe something has already happened; maybe you got a bad result in a test. Your thoughts towards it are probably pretty negative BUT do they have to be? No! Sure, you can't change the way the test went, and you can't change the fact that you have to do that essay. However, you can change the way you feel about it. In fact, it's one of the only things you can change about it, so use that to your advantage! Let's take the bad result on the exam as an example. You did quite badly and you feel really disappointed about it and can't stop thinking about it. Your general attitude at the moment is negative. But does it have to be? No. Only your attitude is making you feel bad, and nothing else. To get rid of this feeling, you should try and change the way you see the situation. Sure, you didn't do as well as you wanted, but you can learn from your mistakes and try and do better next time. Is feeling negative and annoyed about it going to help? No! There are little to no benefits to negative thoughts like these, so if you ever feel yourself experiencing them, really ask yourself do I need to feel this way? Then see if you can come up with a more positive outlook and attitude on the situation. For some reason, the cool thing to do always seems to be to give out and complain about exams, study. This is silly. Don't be afraid to work hard and admit to it! Of course everyone is going to dread and hate these things if everyone treats it so negatively. I often found myself saying things like "yeah, ugh I've so much study do to, this evening is going to be awful!" if people first complained to me about study themselves. You don't have to agree with everyone's opinions. In fact, if you tried to make the situation positive everytime that someone said something negative about homework or study to you, you might find yourself feeling better. Instead, you could say "Ah no, sure I'll have it done in no time and then I get to watch Netflix after! 😊"
You might not notice little things like that making a difference at the start, but try to be aware of automatic negative thoughts and reactions like that, and do your best to turn them into a positive thought in whatever way works for you! We've all done it. Before a test, say "Oh my god I'm going to fail this!!". This is such a negative thought, and even if you're only saying it jokingly, knowing that you'll pass, it's not doing anyone any good to predict failure. Next time someone says this to you, try instead to keep it positive, with a "ah I'm sure it won't be that bad". Going in to an exam, or even tackling an essay or assignment with a negative attitude will not make it any easier for you. Tackling it with a positive attitude however, will always work in your favour, and could have some beneficial and positive effects on your classmates and friends too. If you do positive things in your day outside of school, it might help you have a more positive attitude towards your school work. For example, eating healthy or doing exercise. It won't magically make you a genius or the happiest person on earth, but they are things that can help you feel good and will stand to you for the rest of the day in anything else you do! There are a lot of sweeping assumptions and generalisations made in the secondary school community about various things. For example, everyone says the Leaving Cert is the worst and the hardest thing you'll have to do. Of course, if you hear this before 6th year, you're going to dread it! Someone has already given you an idea of what it's like before you've even tried it, and you're going to just take their word for it. Instead, challenge this. If there's ever something you haven't experienced yet, but you've heard bad things about it, try to look at it positively, differently. Don't assume that you'll feel the same way as everyone else until you've actually experienced it, and make sure to form your own opinion, instead of adopting someone else's negative one. I hope some of these suggestions will help you have a more positive outlook and attitude towards school and your day in general. Remember, you're in control of how you feel!